I haven't done much mullet fishing at all this year. I guess that it's been a combination of weather and opportunity. Other species seem to have occupied my time. On occasion some of my pals have had good fish on the fly but as far as I can recall it's only been the odd mullet or two no one has had a beano with these fish. 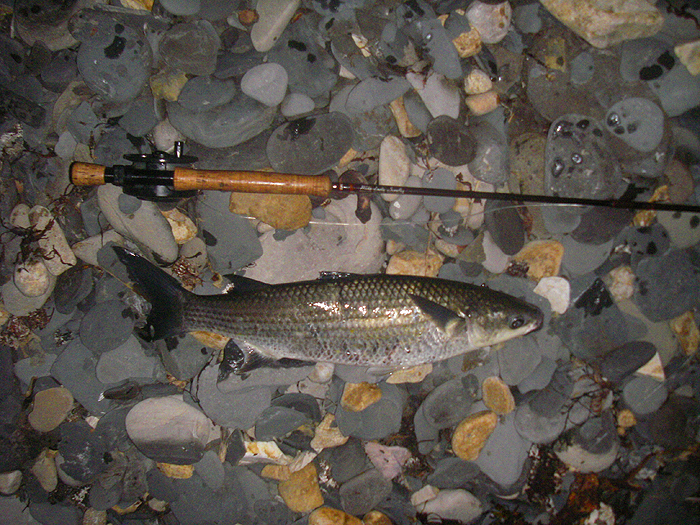 One evening this week I went to the coast with my pal Nigel specifically to try and catch a mullet. We actually went two evenings earlier, knowing that there was a lot of rotting weed and maggots on the beaches. However, the fish didn't turn up. The tide was not quite big enough and the maggots never got into the water, even though the sea was quite rough. We didn't see a single fish so it was an early bath on that trip. The following evening I couldn't go but my pal Rob had a fish of 5lb 7oz on a maggot fly, very encouraging. When I went with Nigel it was the top of a big spring tide, there was loads of maggoty weed washing into the sea and, but for one thing, it would have been perfect. There was a stiff, south-westerly wind, a big swell and the water was full of loose weed. Sure enough the mullet appeared in force but casting a maggot fly to them was never going to be easy. Quite apart from the problem of pushing a fly against the wind and controlling the line in the waves there was the difficulty of getting near enough to the sea. In order to cast a fly to the mullet (which we could see) and to keep the fly line out of the weed and waves (essential) we had to perch on boulders washed by the waves. Within minutes our ankles would be wrapped in kelp resulting in a serious risk of being dragged off our feet by the undertow. Tricky! Anyway, for an hour or more we flogged away – fishless. I was using my 8wt fly rod with a few feet of six pound nylon as a cast and the usual little white plastic ‘fly’ on a size 10 hook. We struggled. It was getting dark and just as we were about to ‘give them best’. The line twitched, I struck and I was in. Playing the fish wasn’t a major problem until it came to landing it. By now my pal was standing beside me ready to lend a hand. Three or four times, with the slender rod hooped round almost into a full circle, I had the fish sliding ashore on a breaking wave and every time it was dragged back by the retreating rush of water before Nigel could lift it out. Eventually, after much slipping, sliding cursing and dealing with masses of weed on the line, the fish was ours. After a couple of pictures the six-pounder was returned to the sea to fight another day. Although it had been difficult fishing it was one of those memorable evenings for me. There may not be many more opportunities to hook a thick-lip on the fly this year so I'm really glad we went while we had the chance.